If you are look to consolidate your outstanding credit card bills and you have good to excellent credit, than the Chase Slate Card is one of the best options out there. When thinking of the best balance transfer credit card the main factors to consider are, duration of 0% APR on the amount that is transferred, and the amount you will pay in the form of a balance transfer fee. Some people will also take into consideration the duration of the 0% APR on new purchases, but you need to always remember that you are getting a balance transfer credit card to pay off existing credit card debt, not to accumulate more of it. So view the Chase Slate card as your ticket to becoming debt free and getting more out of your hard earned money. The Chase Slate card offers 0% APR for 15 months on the existing credit card balances that you transfer over. This will give you plenty of time to get your finances in order and come up with a plan to pay off your debt so that you can get back to enjoying more from your money than paying interest. If you are really interested in the intro rate for new purchases you will also get 0% APR for 15 months on this as well. Just make sure that you have all of it paid off by the time the 0% APR rate ends so that you don’t end up in the same situation that you were before. Most credit cards that allow you to transfer an existing balance over will require you to pay a fee of 3% of the amount that you transfer over. 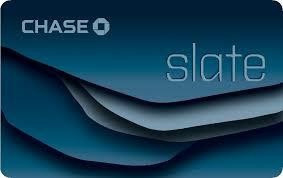 The Chase Slate balance transfer credit card is one of the only cards that does not have a balance transfer fee. The only catch is that you have to make your balance transfer within the first 60 days of opening your account. After that you will pay a balance transfer fee of 3% on any other transfers that you make. The Chase Slate credit card comes with no annual fee. However this card does not offer any rewards for purchases that you make. We think that the savings you will get from paying 0% interest fro 15 months is rewarding enough. Then after you have your balance paid off you can take a look at some great reward credit cards to use in the future. Do you have questions about the Chase Slate or any other balance transfer credit card options? Email us at offer@casavvy.com for our free personalized recommendations. ← So You Found Out You Have A Bad Credit Score. Here’s the Good News.